Watch full One Piece Season 15 Episode 54 English Dubbed full HD online. One Piece Episode 570 English Dubbed online for free in HD. King Neptune talks about the Ancient Weapons and Shirahoshi being one of them to Robin while Caribou listens and makes way to Shirahoshi’s room to capture and sell her. 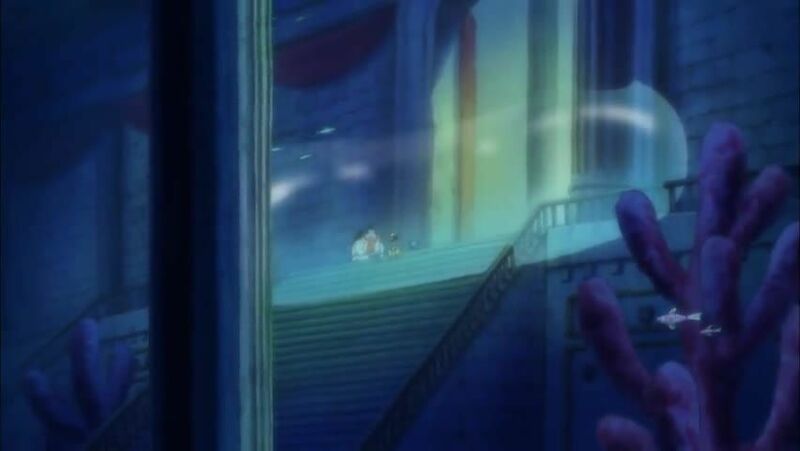 Luffy regroups with the rest of the crew away from the party after Jimbei requested to talk with him and Jimbei explains that Akainu fought against Aokiji for the title of Fleet Admiral on a certain island. Akainu won the title and Aokiji left since he didn’t want to work for Akainu. He also explains the two changes that happened in the new world after two years which is Akainu becoming fleet admiral and Marshall D. Teach taking all of Whitebeard’s territories and claiming the title of “Yonko” among Shanks, Charlotte Linlin and Kaido. Jimbei also claims that Blackbeard is searching for the strongest Devil Fruits so he can extract their abilities and claim them for his own use, with Chopper fearing that he’ll be targeted next and Usopp saying that Blackbeard wouldn’t want his Human-Human fruit ability. Luffy doesn’t listen to Jimbei’s blabbing and Luffy sees Keimi and asks where Shirahoshi is and she says that she is in her room. Luffy senses a “big animal” in the palace so he calls Zoro and Sanji to come with him and they find Caribou using his Logia powers to capture Shirahoshi. Luffy kicks him out and Minister of the Right thanks him once again. Minister of the Right wonders why the tower has been cut into pieces and Pappug says that Zoro did it and Zoro gets mad. After hearing Minister of the Right say that Caribou had stolen all the treasure from the vault and that Neptune would give it all to them, Nami reprimands Luffy, Zoro, and Sanji for not tying Caribou up and angrily kicks them out to find him and get the treasure back. Meanwhile in Hordy’s cell, Hordy and his crew appear to be aged by the energy steroids that they used, which was later revealed to be aging pills, and still sought vengeance against the royal family, the Straw Hats, and humans. As everyone leaves Hordy’s cell, Hordy yells at Fukaboshi for “betraying his kind.” Fukaboshi answers by saying that he won’t hold vengeance on Hordy for killing his mother and orders him to shut up so the children won’t here him and be tainted by his evil. Soon, the Minister of the Left gets news that Baron Tamago and Pekoms, crew members of the Big Mom Pirates, are in Fishman Island going to receive the monthly payment of sweets. With the candy factory destroyed and all the excess candy given to the Straw Hats to eat at the banquet, the Fishman Island can’t pay their monthly payment. The Minister of the Left then states that Big Mom destroys islands that do not give her candy.